One of my favorite things about working as a songwriter in Nashville is finding brilliant collaborators. I've been blessed to work regularly with Tia Sillers, writer of the iconic song "I Hope You Dance", for over 10 years now. 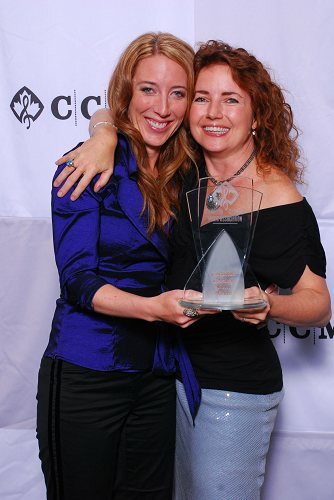 Together we've written many songs for my records ("The Wheel", "Don't Leave the Leavin'", "Get on the Train") and we've even shared the stage at the Canadian Country Music Awards to receive Songwriter of the Year trophies for collaborating on Johnny Reid's hit "Dance with Me". I always love playing shows with Tia and hearing the story behind "I Hope You Dance". Here's how she tells it. Then all of a sudden, this huge black SUV comes pulling up on the beach, kicking sand in all directions, and this guy with a black suit and mirrored sunglasses jumps out and starts SCREAMING into a cell phone! That was my first eureka moment. A couple of weeks later I shared the idea with my co-writer, Mark D. Sanders...and the rest is history." Click here to see Lee Ann Womack's video for her smash hit recording of "I Hope You Dance".